The refreshing summer drink is a combination of six different flavours: spice, salty, sweet, two types of sour and bitter. The spring season is here and so are Indian festivals. Ushering the New Year, these festivals are celebrated across the country, bidding farewell and welcoming a promising year ahead, albeit in different names. Ugadi, as it’s commonly called across Andhra, Telangana and certain parts of Karnataka, is a joyful celebration that marks the start of the spring season. And so, the traditions and customs associated with it that are intricately connected to the nature. Like every other Telangana festival, Ugadi is rich in its culinary delicacies. Food is prepared with six different flavours - sweet, salty, two types of sour, bitter and spice. From sweet and tangy mango pachadi and crispy Obbatu flatbreads to spicy Kodhimbir vada and sesame ladoos - the varieties are many, but it's the Ugadi Pachadi, a refreshing summer drink, that tops them all. 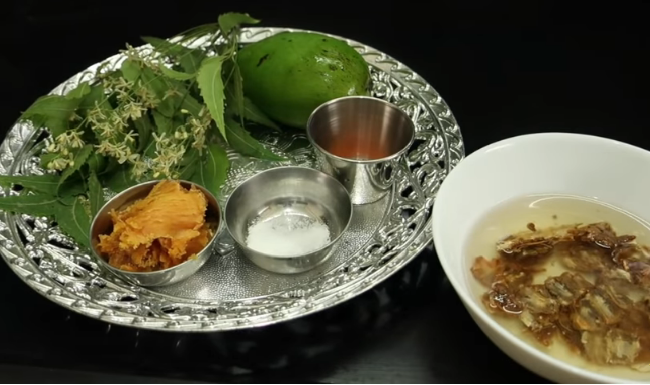 An amalgam of six different tastes, people traditionally begin Ugadi celebrations with the Ugadi Pahchadi, a translucent drink made of raw mango, tamarind, neem flowers, jaggery, salt, green chillies and water. Pachadi in Telugu literally translates to chutney, a dish that tends to represent a variety of flavours. According to folklore, the unique mixture symbolises the happiness and sorrow of life. Siri Rani, a cooking enthusiast and a homemaker, says, “Ugadi pachadi is made up of six tastes - kaaram, uppu, teepi, vagaru, chedu, pulupu (spice, salt, sweet, bitter and two types of sour). According to the Hindu mythology, during the evolution of the cosmos, Brahma commenced the creation of the world on the day of Ugadi. Ugadi is hence considered an auspicious day for new beginnings in life. It is also believed that the first flavour that touches your taste buds while gulping down the drink will decide the fate of course of events in your life for the rest of the year. If it’s the sweetness of jaggery that first hits, it’s a sign of a prosperous year ahead. But if it’s the bitter neem flowers that you first bite on, the year may come along with its own share of bittersweet experiences." For the same reason, Ugadi Pachadi is the first delicacy that is consumed on the day of the festival, even before coffee. The preparation is typically consumed early in the morning on an empty stomach. The proportions of ingredients in the drink are decided according to the six tastes of life. Jaggery stands for happiness, neem flowers is for sorrow while tamarind denotes disgust and mango is for surprise. Green chillies represent anger and salt stands for fear. Explaining the recipe, Bhavani, a home maker, says that each ingredient added is freshly brought from the shop, including the jaggery, which is a crucial element in the drink. “It isn’t difficult to guess why jaggery forms the major component in Ugadi Pachadi. Similar to how we wish only for happiness in our lives, jaggery is added in larger proportions while neem flowers, tamarind paste and raw mangoes are taken in quarters. The jaggery is then cut or grated into fine powder. To separate the neem flowers from the whole flower, take the neem flowers into your hand and rub them between your palms. Chop chillies into fine pieces and add salt according to taste. It is then mixed in water, and stored in earthen pots. The drink is quite an elixir during summer and perfectly balances the taste of other dishes prepared during the festival,” says Bhavani. While in Telangana, jaggery is the only sweet ingredient, people in Andhra sometimes add pieces of banana for sweetness, says Renuka, a dentist and also a culinary expert. The pachadi is not just a festive drink but also holds some value as a health supplement. “While neem has anti-fungal properties, raw mango and tamarind fights infections. As summer marks the outbreak of many diseases, Ugadi pachadi is a cleanser," Renuka says. Siri Rani adds, “While mythology has its own tales behind every celebration, there are also so many scientific reasons behind them. Ugadi Pachadi is a perfect drink for the season and I believe our forefathers cared less for the lore and more on how they could beat the summer heat. But scientific reasons never let people believe in them completely until there are traditions and customs associated to it, or maybe a dollop of mythology as well."